This landscape feature is one that much appeals to me, and which seldom fails to induce a yearning kind of numinosity. 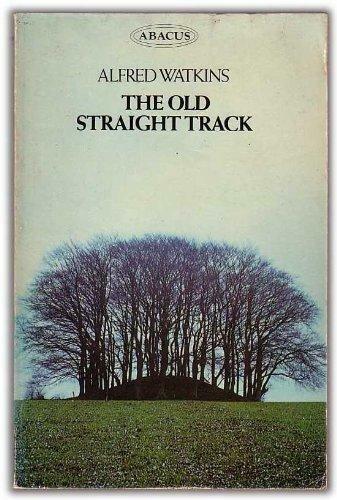 I realised recently that the interest and feeling probably came from the cover of my teenage-bought edition of Alfred Watkins's The Old Straight Track. So that is the (suggested) link between such tree clunps and ancient landscape features - they are supposed to mark 'ley lines', which - according to Watkins - were Neolithic pathways criss-crossing Southern England. I heard about Watkins's book from the references at the end of The Moon of Gomrath by Alan Garner - and found a copy in the Bristol City Library; Garner has the Old Straight Track as a magical path visible only at full moon, as the moon rises - it plays an important part in the story, and provides its most memorable scene. Later, John Michell (in A View over Atlantis) took Watkins's Ley Lines and made them into lines of spiritual power - but I knew nothing of this during my teens. Anyway, all this seems to have left me with a particular sensitivity to a particular landscape feature. The Hundred Acre Wood in Winnie the Pooh is also sometimes depicted like this - which may have been a further latent aspect of my interest; as also a very good children's book called Borrobil by William Croft Dickinson (1944) - a kind of neo-pagan precursor to Narnia, and also written by a Professor. I enjoy these numinous landscapes very much, in fact they might be my favourite thing that you post. I would be interested to know if there is any "real" forest left in the UK, a question I've been intrigued by, as a Robin Hood fan, since learning that the modern remnant of Sherwood Forest is postage stamp-sized. A "hundred acre wood" is a pretty tiny little thing by North American standards. @Matthew - There is no virgin forest in the UK, and there hasn't been since (probably) Neolithic times. The Normans reforested most of England and Southern Scotland, for the nobles to use in hunting, by killing the peasants en masse - but this was gradually cleared after the Middle Ages. There is a fair bit of forest still in some parts - there is a fairly-massive Forestry Commision plantation in Northumberland - near me (Keilder Forest); if you go on Google Maps you can see the amount for yourself. But there aren't many massive areas of solid *native* tree forest in England. Most of the rural areas are moorlands - like the Pennines, the Lake District, Dartmoor, Exmoor, Scottish borders etc - these have intermittent wooded areas, but not continuous tracts of forest. When I was around ten years old, I was entranced by The Hobbit. I saw the Yorkshire Dales landscape as my Middle Earth. Reading your post today was an instant trip to my past. 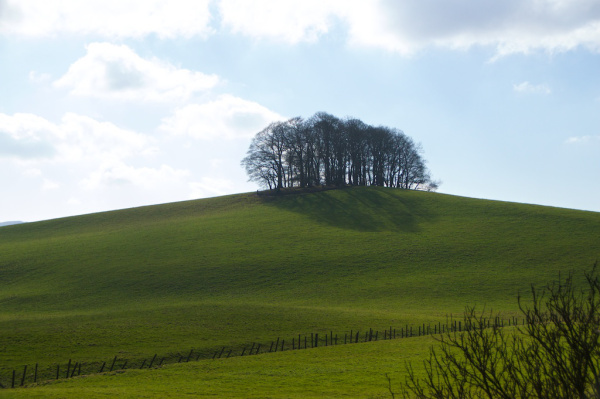 From my Harrogate suburb, I could see the hills, and a lone hilltop tree clump. I named it Bilbo Wood, and I knew that it was a magic place, that the trees were alive and thinking, and Royal with a capital 'R', and that they were on a hill because they were the home of higher things, and if I could get there, everything would be alright. Even as a child, I knew that my thoughts were absolutely correct, that some others could think like me, could access the magic, and that many could not. It was about being on the right wave length. It was a joyful feeling - an intense feeling of being special - a belonging. The sun was shinier and happier, the breeze danced and tumbled, and chortled, and everything was glad to be alive. It wasn't always available - I had to be 'right' - had to be open. It was that immersed in nature, and nature 'talking' back experience that you talk about, that children and primitive peoples do. I remember it, and cherish that memory. I just cannot tell you how much I get a charge out of looking at landscapes (I did much of this in Scotland a few years ago) and thinking to yourself that it's been settled and cultivated for THOUSANDS of years... One could practically feel the spiritual legacy of prior generations, as the Fellowship did while journeying through Hollin. I also did see logging trucks in Scotland, and was very surprised and taken-aback by that, as I have some knowledge of Canadian forestry and an understanding of how much logging is sustainable over how large of an area. I have a yearning to visit these. If you have any personal photos, should consider posting some! It was a joyful feeling - an intense feeling of being special - a belonging. The sun was shinier and happier, the breeze danced and tumbled, and chortled, and everything was glad to be alive. It wasn't always available - I had to be 'right' - had to be open. This is the sort of comment that reinforces my belief in a spiritual dimension. You either know what Tobias is talking about, or you don't, but if you do, tough to deny that there's something Real about it. @Matthew T and @Bruce - I would like to direct your attention to the Forest of Dean, at the extreme southern end of the England-Wales border. It seems to have been at least partially forested since Roman (and almost certainly pre-Roman times) and has been more-or-less continuously protected since then. There's a fairly substantial forested area still, at over 40 square miles, though not by any means all original. I doubt the original forest was ever fully cleared, though there has been plenty of human presence through most of its known history, as due to the unusual geology of the region, there were large, easily-accessed deposits of coal and iron present (there still is some accessible coal and a few tiny private craft mines working it), which were exploited since at least Roman times, and on a large scale during the Industrial revolution. It was indeed used and preserved by the Normans for hunting, but was not really one of their favoured areas (possibly due to its relative isolation from their main power centres). In any case it predated them and had also been used as hunting grounds by their Saxon predecessors; the Romans who dwelt and left important ruins nearby probably hunted there too. The local geology and associated industrial activity may actually have helped preserve the forest area, besides the protections given at various times - much of the region is not well suited for farming, even were the forests cleared, and for those actually living in the area, coal was always readily available for domestic use (large timber was always exploited to some extent for uses such as shipbuilding). Probably the greatest historical threat to what remains of the original forest in the region has actually come recently, through the Forestry Comission (or whatever they are calling themselves lately) - an arm of Government bureaucracy, which is charged with forest conservation and managment. It has chosen to interpret this role by destroying large tracts of original woodland over the last few generations wherever they were not actually under legal protection, and re-planting with large stands of introduced conifers. It may be worth noting that the area was apparently a significant inspiration to both Tolkien and J.K. Rowling. Tolkien seems to have known the area well, and was involved in the excavation of the Roman ruins at at Dwarf's Hill, near Lydney, which inspired his obscure philological meditations on "The Name Nodens", appended to the original excavation report. Puzzlewood, a small area of extremely ancient woodland with odd geological features and containing numerous relics of ancient ironworking, has been cited a number of times as a particularly likely inspiration for Middle-Earth. The frequent occurence within the area of sites containing patches of genuine ancient woodland and the ruins of ancient and pre-modern dwellings, mines,and industrial workings from various periods, all existing in close proximity, has no parallel anywhere else in Britian, so far as I know. Rowling spent her later childhood and adolescence on the margins of the region, in the village of Tutshill. Besides the forest itself playing a central role in one or two of the later Potter books, there are (to those in the know) obvious references to the region in the "Forbidden Forest" on Hogwarts grounds, and the character of Hagrid, who is obviously modeled on a rough-and-ready local dialect speaker (with modernized speech so as to be remotely intelligible to modern readers), of whom she presumably encountered quite a number during her youth when use of the local dialect was more commonplace. @Hrothgar, thanks for that comment, it was right up my alley and I enjoyed it very much. @H - I tend to regard the Forest of Dene as across the border rather than 'English', which is why I didn't mention it. I have visited a couple of times, but in the parts I saw it is not virgin forest nor anything like; albeit it is very pleasing. There were a lot of remnants of old industry from the early Industrial Revolution; and (in the 1970s) remnants and still active family run, coal mines - like doorways into hillsides and slopes running down an incline. I don't regard the Forest of Dene as a significant influence on Tolkien - in all his writings I don't recall him mentioning it, or visiting except for the time you mention, which he was asked to do in his professional capacity. The West Midlands was clearly the region that most deeply inspired Tolkien, as he said many times. There are patches of ancient woodland, and trees, scattered around England, and it is wonderful to discover or visit them - but I thought Matthew was asking about big tracts of forest. I quite often visit an ancient yew tree in Beltingham, Northumberland - in the church yard; which may have been there since the time of Alfred the Great and the Danelaw - although this is not possible to confirm or deny with current methods. @Bruce - Well, technically it's within Gloucestershire and therefore English, though to be honest cultural connections have historically been very slight - though they have increased in recent times due to better transport links and lack of local jobs since the shutting down of heavy industry. The more obvious connection is with South Wales, and there is indeed a lot of Welsh admixture in the local population. Nearly all people born and bred there would consider themselves English though, and the traditional dialect is essentially a semi-fossilised variant of the older English once spoken throughout Wessex. Now that you mention it, I don't remember Tolkien writing about the Forest elsewhere either, but I have seen quite a number of third-party references, albeit always unsourced, and have tended to assume they were actually based on something that I had not read. Of course it is also entirely possible that someone just made them up (perhaps to take advantage of his fame for marketing local tourism? ), and others simply copied this. Wouldn't surprise me, as we are not exactly surrounded by truth these days! It does have some very specific features that would be hard to find anywhere else though, as mentioned, besides the woods in some parts being quite impressive in their own right; so it would be interesting to see where else, specifically, he might have derived similar influences. I do suspect, though, that it may be as good as anyone will get who is looking for large tracts of true British forest, considering its still substantial size and the fact that it does contain areas that were probably never completely cleared since prehistoric times (though subject to other types of human interference, obviously). There's little else of any real size, sadly - though the New Forest might serve as a stand-in if you can overlook the fact that it was probably established in its current form via brutal clearance of the local occupants by tne Normans, as you alluded to earlier. WRT the ancient Yew - I for one am more inclined to trust ancient folk memory than modern positivism in such matters. It is a definitely reliable guide to meaning over and above what it says about fact; whereas positivism is only sometimes a reliable guide to fact, and has nothing to contribute meaning-wise at all. @Hrothgar - "(perhaps to take advantage of his fame for marketing local tourism?)" - a lot of this has been going on lately! Of course, Tolkien will have got individual ideas from a multitude of places, but I've always found it a bit trivial! It's a different matter for Rowling, of course - there is a real, deep link there. My original answer was addressed to someone from North America, with the ideas and assumptions about big tracts of forest derived from that continent. By those lights, the British forests are patches of woodland only. But of course you are right to emphasise that the numinous awaits the attuned mind all over this multi-layered, thoroughly lived-in, haunted landscape of England (even in a suburb such as the one where I dwell) - sometimes spread-out and sometimes tucked away - and the Forest of Dene is one of the special places for sure!